Written by Valerie McPherson. Valerie was a tour guest on one of our Cobourg Peninsula tours in 2015. On a recent trip to the Cobourg Peninsula in the Northern Territory I visited the ruins of Victoria Settlement at Port Essington. 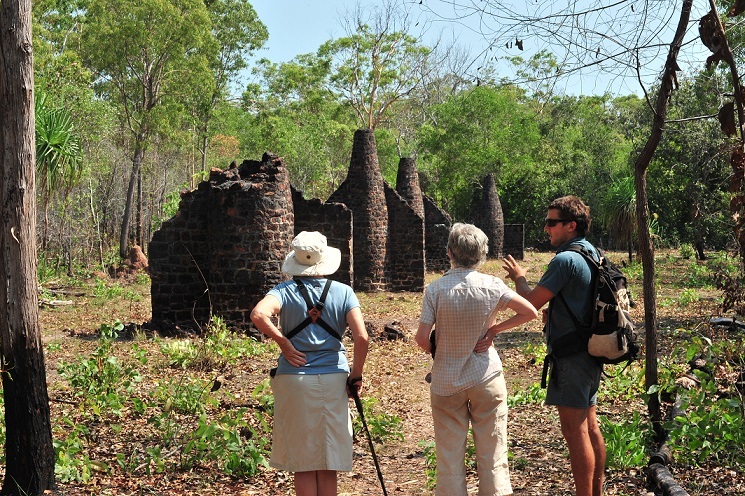 Victoria Settlement, established 1838 and disbanded 1849, was brought about by a plan of the British government and the East India Company to set up a military settlement and a re-victualling point for shipping through Torres Strait. Captain Phillip Parker King, R.N., sailed along the Great Barrier Reef and around the Territory coast to the west between 1817 and 1821 charting the coastline. 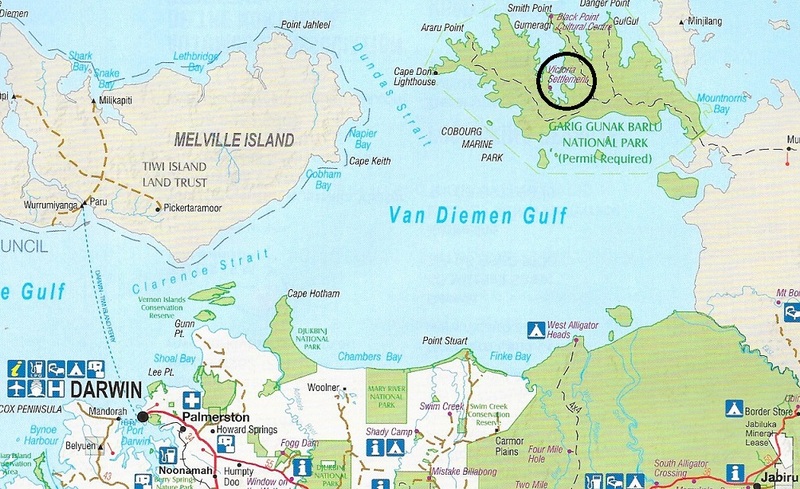 He advocated a settlement in the north and chose Port Essington, named after an admiral of Trafalgar days, as a likely site. Claims that the Dutch were preparing to set up a trading post on our unclaimed northern coast precipitated action by the British Government. In January 1824 Captain Gordon Bremer in “HMS Tamar” was sent to Sydney to collect stores, marines and convicts, with instructions to sail north to Port Essington and there establish a fortified outpost. This attempt at settlement on Melville Island, and another at Fort Wellington on Raffles Bay in 1827, were both abandoned in 1828 and 1829 respectively. Their failure was due to a number of reasons – the oppressive climate, sickness, loneliness, monotony, depression and hostile aborigines, all of which contributed. The third attempt at settlement in the north began when two ships “Alligator” and “Britomart” left Plymouth on 19th February 1838, with Captain Bremer in charge of the expedition and Captain John McArthur, his second in command, in charge of the Royal Marines. Also in the crew were 1st Lieut. Priest, 1 Sergeant, 1 Fifer, 21 Privates and 3 Civilians, namely James McArthur (son of John McArthur) storekeeper, George Earl MRAS linguist and draftsman, and John Armstrong botanist. The route of the voyage was via the Canary Islands, Rio de Janeiro, Cape of Good Hope and Port Wakefield in South Australia. At Port Wakefield Capt. Bremer took on extra marines with wives and children. These marines had been detained in South Australia from HMS “Buffalo” to provide protection for the Colony. In all, 12 marines, 3 wives, 2 children and Assistant Surgeon Whipple joined the expedition which was solely of a naval character. At Sydney the supply ship “Orontes” joined the expedition. Thirty four iron tanks for the storage of foodstuffs and several timber framed weatherboard pre-fabricated buildings were loaded on board. There were two houses, two barrack rooms, a kitchen, storehouse, a hospital and a church.The botanist Armstrong procured a selection of plants, seeds etc. for establishment at the settlement. Captain Bremer was to be Commandant and Magistrate of the new settlement. Officers were Captain John McArthur, Royal Marines, Lieut AL Kuper, Royal Navy and Lieut Phineas Priest, Royal Marines. On 17th September 1838 “Alligator”, “Britomart” under the command of Captain Owen Stanley, and “Orontes” left Sydney Cove accompanied by two other ships which were bound for India. They arrived at Port Essington on 26th October where local aborigines welcomed their arrival and helped them find water. With the aid of convicts assigned to the expedition the pre-fabricated buildings were erected. Local rock was used for foundations. Crushed shells were burnt for lime, kilns built and bricks and mortar made. Brick barracks, a brick Government House and cottages with chimneys were built. The quarters of the storekeeper Mr Earl were built on 8ft poles with a shingle roof and enclosed underneath with masonry for use as a spirit store. The bread store also had 8ft poles but was not enclosed underneath. A stone pier was constructed out into deep water. On 25th November 1839 a great hurricane caused much damage to the settlement and to the wharf. The brig “Pelorus” had been driven ashore with the loss of twelve lives. It was nine months before a relief ship “HMS Gilmore” arrived. Convicts loaned to the settlement assisted with laboring and tradesmen type work. In tropical heat and unsuitable military uniforms the soldier settlers endured great hardship and deprivation. Sickness was prevalent in 1843 at the settlement. With no sea breeze at the land- locked harbour, fever was a deadly scourge. The gardens could not be tended by sick men and so scurvy broke out. Buffaloes and ponies brought from Timor went wild and roamed the bush in increasing numbers. There were no medicines and not a sign of a ship’s sail for a year. The only work was the digging of graves. Every morning, those Marines who could stand, drilled on the hard parade ground in choking hot uniforms under the merciless tropic sun. Then in December 1845, Dr Ludwig Leichhardt and his ragged starving band came out of the heat haze of the unknown interior. They joyfully hailed Port Essington as civilization after more than 14 months without seeing another white man. The settlement fed and nursed them back to health and it was not long afterwards that the country was celebrating the deeds of Leichhardt and his men. In 1844 Lieut. 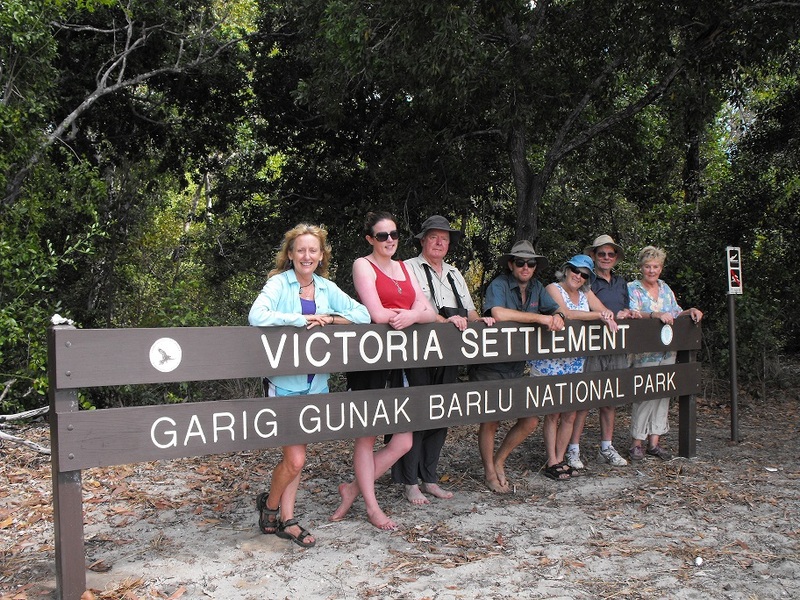 George Lambrick, his wife Emma, their 18 months old daughter Emma and a new-born son arrived at Victoria and in 1845 a Tyrolean Roman Catholic missionary, Fr Angelo Bernard Confalonieri, arrived to care for the spiritual needs of the settlement and also to administer to the aborigines. Fr Confalonieri had been shipwrecked in Torres Strait and arrived at the settlement devoid of any possessions. McArthur got the marines to build him a hut at Black Rock Point just south of Point Smith. In recent years ruins of Victoria Settlement have been reclaimed from the undergrowth and identification made of the various buildings. The Cornish type chimneys, the powder magazine and brick kiln have been restored or partly restored and evidence of the huge ovens of the hospital kitchen and the blacksmith’s forge can be seen. A cemetery was also part of the settlement and in the eleven years of its existence burials were recorded. Memorial headstones were not erected until some years after the abandonment of the settlement and it is thought that some were renovated several years later again. By this time inscriptions were almost illegible and the stonemason relied on an English speaking aborigine to help him to complete his work. There are five remaining headstones in the cemetery. A large memorial with an inscription: “In memory of Mrs Lambrick and child. Dearly beloved wife of Lieut Lambrick 47th Regt Hobart Died Port Essington”. In October 1846 Mrs Emma Lambrick died and was buried beside the infant son who had pre-deceased her eighteen months earlier. One month later her recently born infant also died. “Sacred to the memory of Father Von Anslowe German Messoner, Smiths Point. Died Port Essington 1845”Note: This inscription should read Don Angelo Confalonieri and the year 1848. On 9th January 1848 Fr Confalonieri died in the hospital. He had been found in his hut a few days before, suffering from fever, and was taken to the hospital. “Sacred to the memory of the Dr of the Settlement Died Port Essington”. Note: Richard Tiltson March 1849. Another of the remaining headstones reads—“Sacred to the memory of Captain Crawford 47 Regiment Hobart. Died Port Essington”.Note: This inscription should read Phillip Chetwode Captain of Royalist. In September 1843, remittent fever claimed the lives of Pte Brown and Capt Chetwode and in January 1844 Pte Sheppard also died. And the last headstone is small, flat and broken with no identification. By 1849 the British Government had come to regard the Port Essington settlement as a failure, both as a colonizing experiment, a trading post, and a port of call for ships. On 3rd November 1849 the settlement was abandoned and Captain McArthur and his company sailed away on “Meander” for Sydney, the friendly aborigines wailing in grief. McArthur, Lambrick with his daughter Emma, and Lieutenant Dunbar returned to England arriving there on 9th November 1850. A plaque at the cemetery at Victoria lists sixty names of those buried there most of whom are Royal Marines or Royal Navy. The first two burials, Pte Joseph Churchill and Pte Edmund Oakley, dated 22nd September 1824, would have been members of Captain Bremer’s first expedition which was only at Port Essington for a few days. Following the names of these two soldiers is the word “3 Buffs”. Internet research has revealed that “Buffs” was a British Army infantry regiment - Royal East Kent Regiment 3rd Regiment of Foot, commonly known as “Buffs”. The name originated from the use of protective buff coats made of soft leather during service in the Netherlands in the 17th century. Later they adopted buff coloured facings and waistcoats as uniform distinctions and wore equipment of natural buff leather. The Royal East Kent Regiment saw service in Australia from 1821 to 1827 guarding convicts on the voyage out and also in the colony. This was most likely the role of the “Buffs” at Victoria Settlement. Throughout the eleven years of the settlement the aborigines had remained friendly and helpful. One of them, Jacky Davis, continued to care for the lonely graves of Lieutenant Lambrick’s wife and children who had died from fever. A pioneer trader and buffalo shooter, E.O. Robinson, lived at the site of the old settlement for many years from about 1877. He was a friend to about 400 aborigines and he traded with the Malays, but apart from occasional visits from tourist groups and other interested parties, all is now silent at Victoria settlement on Port Essington. The N.T. State Reference Library where I read “Forsaken Settlement” by Peter Spillett and ”Early Attempts at Settlement in the Northern Territory (1804 – 1870)” by Glenville Pike FRGA. Venture North Australia for their 5 day Safari which enabled me to visit this remote place.